Our Spring Sale is in progress, with 30% off all single-user and home network licenses and upgrades. Upgrade yourself or buy a gift. If you want to help us more directly, you can make a recurring pledge using our new Patreon or make a donation via PayPal. See here for more details and other news. ThumbsPlus is a photo and graphics organizing and searching database and application for Microsoft Windows. It creates thumbnails and views images, vector files, fonts, videos, and metafiles. It also includes editing, batch editing and format conversion, searching and sorting by image similarity, image filters and processes, creating contact sheets, printing images and catalogs, displaying slide shows, changing wallpaper, launching external editors, installing and removing fonts, managing offline media, and automatically saving screen and window captures. ThumbsPlus is the perfect solution for anyone with lots of photos, movies, metafiles, fonts, and other digital assets to organize, manage, and edit. The professional and network editions support all common digital camera raw image formats, including Canon, Nikon, Kodak, Fuji, Ricoh, Minolta, Sony, Pentax, Leica, and Foveon. It also supports several scientific file formats. ThumbsPlus is built around a relational database, which can be shared over a network. It directly supports Microsoft Access (default) and SQLite databases. True client/server databases are also supported in network configurations. Both SQLite3 and Client/Server databases can store as many thumbnails as you have disk space for! Even using a default Access JET (.tpdb8) database, you can store millions of thumbnails by moving the thumbnail data to external files. ThumbsPlus is a desktop application for Microsoft Windows. Both 32 and 64-bit OSes are supported. The Windows Desktop Experience component is required for running on Windows Server. ThumbsPlus version 10 SP2 will install and run on Windows XP (SP3 required) and Server 2003, but we don't do significant testing and cannot provide support for these obsolete systems. 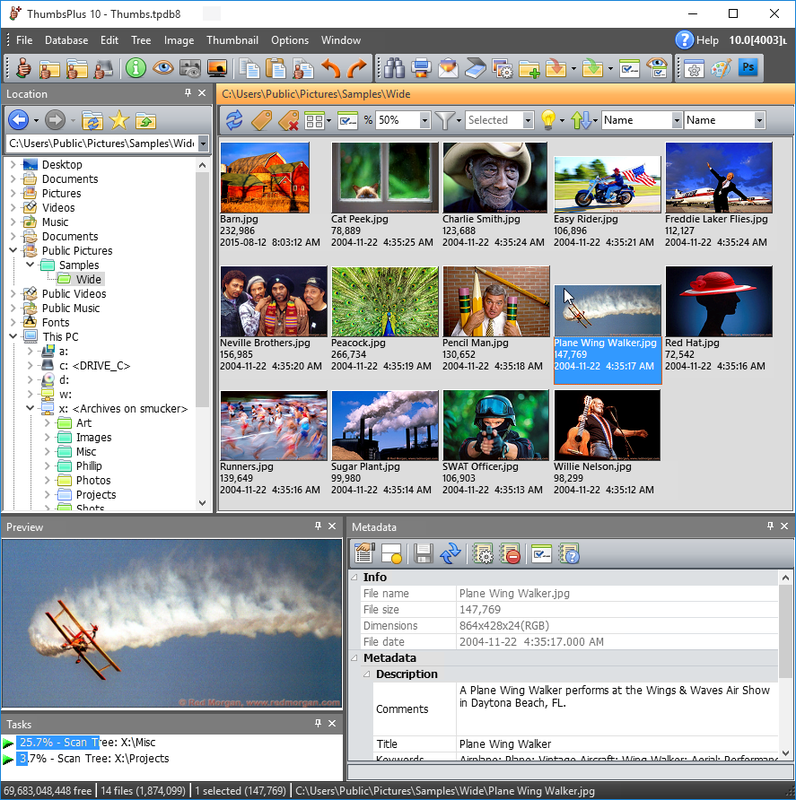 In the main window, you can explore your computer and the network, open view contents of folders, search for files, attach keywords to files, assign files to galleries, view found lists, view galleries, and show Zip files as folders. Start background tasks (including making thumbnails, batch processing, printing catalogs, and more), and do most normal file management, much like Windows Explorer. In the view window, you can perform various image editing functions, including crop, adjust color, change color depth (image mode), cut and paste, dozens of image filters, and various processes. Customize how you want the image window to appear. A magnifying loupe and crosshair cursor are available. Use an image loupe to show the area around the cursor in a magnifying glass window. Display timed or manual slide shows with effects. You can edit the XMP (including EXIF and IPC) metadata for any single image directly in a panel in the main window. For modifying multiple files, there is a Metadata Batch Editor with extensive options. You can save and recall metadata batches. You use batch processes to edit multiple images using the same set of instructions. Almost all image editing functions are available in batch processes. Quickly save and restore these batch sets, and you can even call one batch set from another. This allows you to generate multiple output files from each input file. ThumbsPlus supports both Microsoft Access (JET) and SQLite3 database in all editions. The Professional and Network editions also support client/server databases, such as MySQL, MariaDB, PostgreSQL, and Microsoft SQL Server. ThumbsPlus stores image metrics along with the thumbnails, so you can search and sort by image similarity. Build web pages with tables thumbnails, linking either directly to images or to pages with images and details. Users may run ThumbsPlus simultaneously on up to the number of licensed computers.